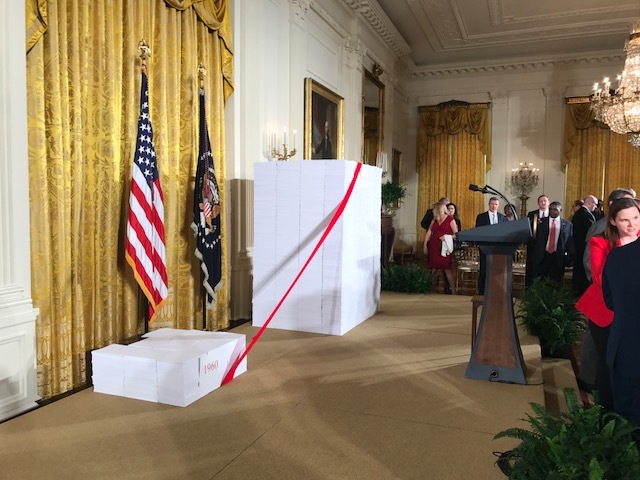 The White House used visual aids to demonstrate how red tape and regulations put a drag on transportation construction. ARTBA President & CEO Pete Ruane and other senior staff made several trips to the White House this week to discuss the Trump administration’s infrastructure package and regulatory reform efforts. Under the theme “Cutting the Red Tape,” an Oct. 2 session focused on the administration’s goal of regulatory reform across a number of different areas. Vice President Mike Pence discussed activities underway in all federal agencies aimed at repealing, reducing and rewriting existing federal regulations that are outdated and unnecessary. Later that afternoon, ARTBA staff attended events at the U.S. Department of Transportation (U.S. DOT) and Small Business Administration. The U.S. DOT event coincided with the agency’s second Federal Register notice for suggestions on regulatory reform. The formal comment period closes Nov. 1. ARTBA has previously submitted it’s regulatory reform priorities to multiple U.S. DOT and other agencies. The association will continue to be involved with the administration’s efforts to reduce unnecessary delays and obstacles in the infrastructure permitting process. Former ARTBA Transportation Officials Division President Paul Gruner, Montgomery County Engineer in Dayton, Ohio, represented ARTBA at a White House briefing on the administration’s infrastructure package. Administration officials described their intent to use $200 billion in new federal spending to incentivize $800 billion in state, local, and private sector investment in infrastructure improvements. It remains unclear when the administration’s proposal will be released.